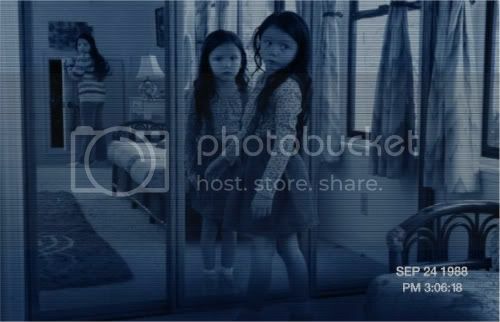 The “Paranormal Activity” franchise returns tomorrow with another scary yet less cohesive installment. Just like the trailers imply, we finally learn why sisters Katie and Kristi are haunted by what we assume to be a demon. However, by the film’s end, I had more questions about the evil entity, and was slightly disappointed that snippets from the trailer and TV spots didn’t make it into the theatrical release. I imagine the omitted scenes will be included in the director’s cut. As far as the questions I have, they’ll probably be answered in “Paranormal Activity 4” — should there be another. But before the possibility of another “Activity” can be discussed, let’s talk about “Paranormal Activity 3.” I enjoyed it, but not as much as the first two. The film begins in 2005. A pregnant Kristi (Sprague Grayden) and older sister Katie (Katie Featherston) discover a box of old VHS tapes. Rewind to 1988, to when the sisters are children. We first see the two darling little girls at Katie’s birthday party. While the eldest enjoys the camera’s attention, the youngest is in the background speaking to an invisible friend. Yes, you guessed it; this is a definite precursor of things to come. Set in Carlsbad, Calif., inside a high-ceiling, two-story home, the adults in this equation consist of Julie (Laurie Bittner), Katie (Chloe Csengery) and Kristi’s mother (Jessica Brown), and her boyfriend Dennis (Chris Smith) who so happens to be a wedding videographer. Strange noises are soon heard in the middle of the night, prompting Dennis to stage video cameras in each room. In a brilliant and inspired move on behalf of filmmakers Henry Joost and Ariel Schulman (“Catfish”), Dennis rigs a camera on the base of an oscillating fan and places it near the kitchen. As the camera slowly pans back and forth from area to area, the viewer sits anxiety ridden as spooks are revealed gradually. At this stage, the scares are foreseeable and so are some of the tricks, but the predictability doesn’t make the frights any less jarring. In a packed theater, the audience jumped and screamed on cue — and I am not ashamed to admit to being one of the participants. As for the twist, and there is one, most will have figured it out long before it is exposed since it was alluded to in “Paranormal Activity 2.” Yet as I noted before, some things are left open for the viewer to piece together. Unlike “Paranormal Activity 2,” which fused pretty well with the original, “PA3” felt separate. It certainly goes into a different direction in the end. And I couldn’t help but wonder why the girls didn’t remember any of what occurred later on. If only I could get my hands on the director’s cut. There will be plenty of discussion following the release of “Paranormal Activity 3” on message boards and blogs alike. This is good news for Paramount should they choose to continue the series. I can’t imagine them not doing so. Like “Saw,” the “Paranormal” franchise is a guaranteed box office draw. We just can’t seem to get enough of the evil demon and the family it is bound to. Although I felt the overall story was weak (too many scares and not enough plot), I left the theater unsettled. And since the movie’s main goal is to do just that, I think “Paranormal Activity 3” succeeded in what it was supposed to do and that was to terrify. If you’re not looking for anything more than that, you will definitely love the prequel to the prequel. Seeing as this is the month of Halloween — a time when many of us are looking to be scared out of our seats — I recommend seeing this opening weekend with a group of friends and make it an event. “Paranormal Activity 3” opens tomorrow nationwide and is rated R for some violence, language, brief sexuality and drug use. Saw the film, thought it was creepy and the story pretty much made sense in the timeline they had laid out before. I could have done without the theater full of rowdy teenagers that talked throughout the film.